Entertainment - The Late Show with David Letterman have aired for 32 years. Soon, the talk show will end. In the last 2 weeks, this event has inviting many famous Hollywood actress. Many musicians, actors, until the actress talked about memories with the host, David. They tell their current activities. Among the guest stars, there is Bill Murray, Eddie Vedder, and Jimmy Kimmel are giving farewell to David. In addition to these three men, many rows of public figures give a parting sentence and sweet memories with the host. 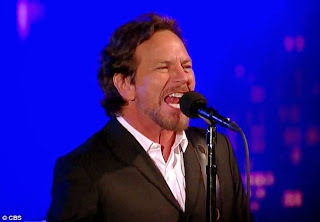 Pearl Jam frontman Eddie Vedder, appearing in The Late Show with David Letterman on Monday (18/05/2015). Eddie's first show of this event in 1996. At that time, he brought the single Black, after David sang Pearl Jam. That night, Eddie brought the single Better Man - Pearl Jam single from the album Vitalogy (1994) - in collaboration with the house band Paul Shaffer and the CBS Orchestra. He was grateful for the opportunity given to him and Pearl Jam to perform in this event. For the sake of parting with David, Bill Murray willing to jump on the giant cake and covered in icing sugar. Yikes! Bill was on The Late Show on Tuesday (19/05/2015). Reporting from E! News, Wednesday (20/05/2015), Bill is the first guest David in The Late Night in 1982 on NBC. When David hosted The Late Show in 1993 at CBS, actor The Grand Budapest Hotel is also the first guest David. Furthermore, Bill often appeared on the friend. Jimmy Kimmel has fond memories with David. Jimmy Kimmel Live! I still remember very well how the figure of David is able to realize his goal. When Jimmy was a teenager, he often fill the night with the draw and see the show David. One day, he aspired to be an artist. Until the 16th anniversary, Jimmy's mother made him a cake of The Late Show. "I watched the show every night and never missed it, and little did I know that many years, and many pounds later, that watching the show was a great education for me. I learned almost nothing in college. I really did not. But watching Late Night, not only did I learn how to do everything from Dave, the reason I have this show is Because The executives at ABC saw me when I was a guest on Dave's show and hired me to host this show. I want to thank Dave and his writers and his producers, "he said with teary. The last event The Late Show with David Latterman will appear on tonight on CBS. No Comment to " Eddie Vedder and Bill Murray Farewell to David Letterman "